It was a perfect weekend and I took advantage by BBQing with friends on Friday night, hanging out at Eastern Village's happy hour on the roof Saturday night, playing tennis with neighbor Steve, and mountain biking with neighbor Mark and other friends. Just another example of how great it is to live in cohousing, where there's always someone nearby to share adventures. 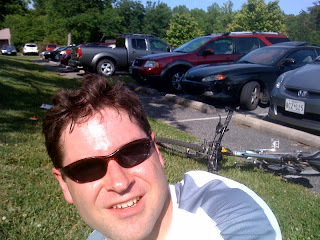 The mountain bike trails at Fairland State Park, just 10 minutes north of Silver Spring on Highway 29, offer enough rolling hills through the forest to have me physically exhausted this Sunday night.